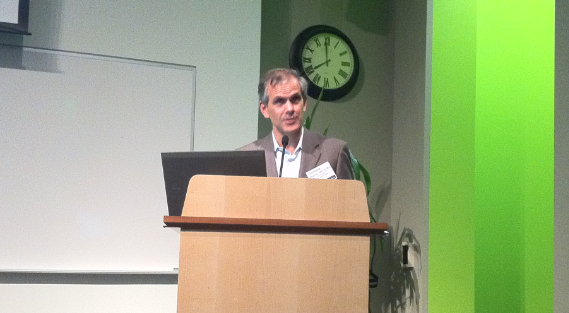 UW Medicine held its annual Turner Society reception at the UW Medicine research campus in South Lake Union yesterday. The labs and offices, built around the former Washington Natural Gas “blue flame” building, provided a sleek and modern backdrop for this year’s gathering. The keynote presentation was delivered by ﻿Christopher Murray, MD, DPhil, director of the Institute for Health Metrics and Evaluation (IHME). The IHME, a group for which we have expressed admiration before, is one of the many world-class organizations affiliated with the University of Washington. Before filing into the auditorium for Dr. Murray’s talk, the donors in attendance got chatty over wine and hors d’oeuvres. One of the fun things about these events, even more than the meatballs and roasted broccolini, is the chance to talk one-on-one with IHME-affiliated graduate students doing groundbreaking work in public health. Students, each contributors to published academic papers, were deployed throughout the ground floor space with placards displaying the fruits of their research, ready to engage the gathered congregants in scholarly discourse. Although the IHME’s mission is to ﻿﻿﻿improve the health of the world’s populations, Dr. Murray’s lecture addressed mortality here at home, in the United States, but did so from a global perspective. Dr. Murray grapples with mortality as the clock ticks, quite literally, over his shoulder. While the United States is number one in health spending, it is far down the list in life expectancy. But within the United States, mortality varies wildly. Dr. Murray's mortality map with the legend magnified. Dr. Murray presented a fairly standard information graphic, shown above, illustrating male mortality by county, but with a twist. Instead of expressing mortality as a rate or an age, he showed it as an equivalent nation in the world. So, while many counties in the Pacific Northwest have mortality like Japan’s (dark blue) or Norway’s (blue), other counties, including a broad swath of the Deep South, have life expectancies closer to Vietnam’s (orange) or Iran’s (purple). 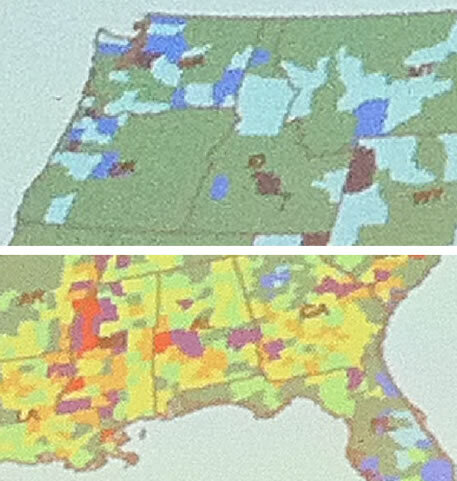 Mortality in the Pacific Northwest (top) and the Deep South (bottom). Without question, there is room for dramatic improvement in mortality outcomes in the developing world. 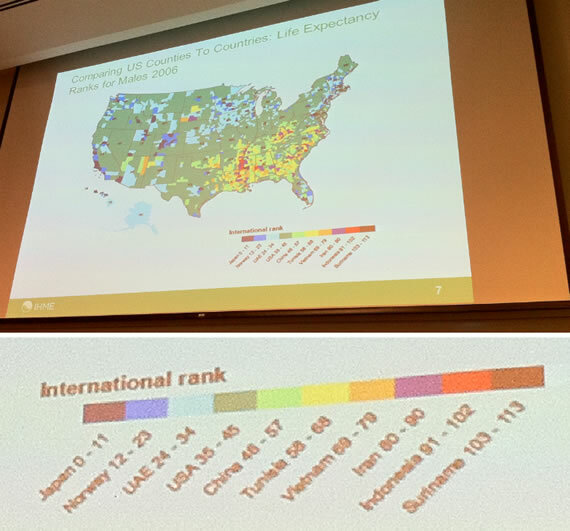 But, it’s clear from Dr. Murray’s presentation that there are significant public health disparities to be addressed within the United States, as well. And the solutions are not always obvious without methodical examination of data. Mortality, after all, is a matter of life and death, and a topic worthy of research. By supporting UW Medicine, members of the Turner Society are contributing to the IHME’s mission to provide the most rigorous public health information to policymakers around the world. Update: The IHME posted a compact and informative summary of the event, including poster presentations of IHME students and fellows, here. President Obama visited Seattle today, speaking to a packed ballroom at the Westin Seattle. The appearance was billed as the Murray Victory Luncheon with President Barack Obama, a fundraiser for Patty Murray’s senate campaign. Security was tight; much tighter than when Vice President Joe Biden visited several months ago. The line to register and pass through security stretched down the escalator, out the door and around the block. With the mercury pushing 90 degrees, it was a bad day to wear a suit. You’ll often hear events like these described as “$500 a plate fundraisers,” implying perhaps that they are gatherings for fat cats rich enough to regularly drop $500 for lunch. But the attendees weren’t all millionaires. At my table was a young real estate agent, an unemployed office worker and a small business owner, among others, united more by their support of Patty Murray than by their tax bracket. And I can say with certainty that no one was there for the food. Lunch today consisted of cold shrimp, rubbery chicken and garnish masquerading as salad. I’m a carnivore but I opted for the vegetarian plate, partly for safety reasons. The President wisely stopped for a turkey sandwich at Grand Central Bakery in Pioneer Square before making his way to the Westin. President Obama shaking hands at the Seattle Westin, flanked by Secret Service agents. 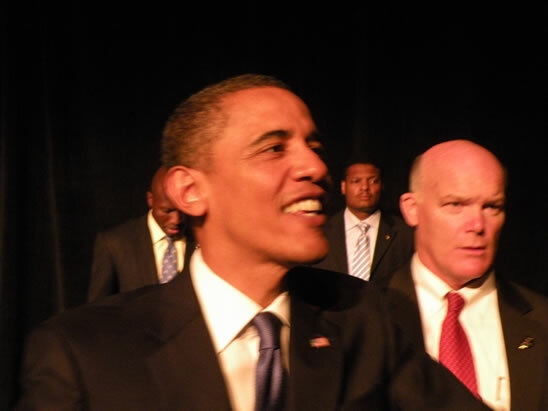 Presidential "body man" Reggie Love can be seen behind Obama's right ear. There were a number of light moments, like when Congressman Jay Inslee facetiously announced his intention to introduce a “three strikes” bill in the U.S. House of Representatives directed at Senator Murray’s likely Republican opponent, Dino Rossi. Of course, he was referring to Mr. Rossi’s failed runs for governor in 2004, again in 2008, and now his current Senate candidacy. Following a short Murray campaign video, Governor Chris Gregoire appeared on stage without introduction, garnering whoops and cheers once people realized she was standing there. She offered testimony of Senator Murray’s work ethic and single-minded focus on the issues important to Washington State. Having run against Dino Rossi twice, Ms. Gregoire expressed that she identifies with Senator Murray’s current situation and offered her conviction that things will work out in the end. After the Governor concluded her remarks, Suzi LeVine went on stage, delivering a brief but enthusiastic pitch to donate money on behalf of Democratic candidates. Suzi is my neighbor, an ultra-smart person, and a full-time activist for Democratic causes and early childhood development. Not wanting to presume the outcome of today’s primary election, Patty Murray never mentioned Dino Rossi by name. Instead, Patty’s speech focused on the principles that drive her work in the Senate. When the press pool and White House photographer Pete Souza appeared below the stage, it was clear the President was in the building and Patty wasted no time introducing him. President Obama’s policy remarks focused mainly on the economy, noting that, while the economy is in serious shape, job growth is positive now after severe job losses in the waning months of the previous administration. He said he didn’t intend to re-litigate the past but he was determined not to repeat it. Update: The New York Times just published a fun article on President Obama’s Slurpee comment, along with more accurate quotes. Sorry, I’m writing from memory; the professional journalists at the Times use a recorder. Seattle Children’s Hospital and Medical Center is one of a growing number of local providers making a long-term commitment to lean and reaping the benefits, a success story highlighed Sunday in The New York Times. Along with Virginia Mason and Group Health, Seattle Children’s draws a steady stream of visitors to Seattle to see how lean can be successfully implemented in a healthcare setting. On June 10, Ms. Munn helped lead a one-day strike by the Minnesota Nurses Association against six local health care corporations, including her employer, partly in protest of lower staffing levels her union thinks have resulted from hospitals’ “lean” methods. Journalists can’t be experts in every subject (although beat reporters make a reasonable effort). So, to avoid unduly favoring one viewpoint over another, they report two sides and let the reader decide. You can say I’m biased but, contrary to a vocal faction within the Minnesota Nurses Association, evidence shows lean improves patient safety. Done right, the benefits of lean accrue not just to the patient, but also to the individuals caring for the patient and the hospital’s bottom line, generally in that order. Of course, lean is difficult, it takes time to master, and it doesn’t always show results right away. The two pillars of lean are continuous improvement and respect for people. However, there are aspects of lean that can ring alarm bells among employees who do not yet have a wholistic appreciation for lean. The first is standardized work. In lean, first you standardize, then you improve. Improving a non-standard process is like remodeling a house built on quicksand. It won’t do you much good in the long run. Mr. Graban, one of the leading voices in lean healthcare, exercised laudable restraint in his responses. In fact, it must have felt a tiny bit awkward being party to a “lean vs. union” debate, since lean production systems operate with the full blessing and support of union leadership and membership in a wide range of workplaces, from hosptials to automobile plants. Children’s of Minnesota, the object of the Minnesota Nurses Association’s misplaced suspicion, is a mission-driven not-for-profit organization. While no organization is immune to bad decision-making, the argument that Children’s of Minnesota is knowingly endangering patients to make a quick buck falls flat. The second aspect of lean that can ring alarm bells is its association with Toyota. Indeed, lean’s greatest champion can sometimes be its greatest Achilles heel. Isn’t lean the system invented by Toyota? critics may ask. Why would anyone want to send an uncontrollably accelerating Prius careening down the corridors of a hospital? Again, there’s no equally visceral counter-argument. Lean is a mostly scientific process, driven by front-line care providers based on evidence. One can respond with evidence but, as we see in arguments over climate change or evolution, evidence is not always the primary medium of exchange in certain debates. Instead, we hear that caring for sick people is not the same as building automobiles. And it’s true. 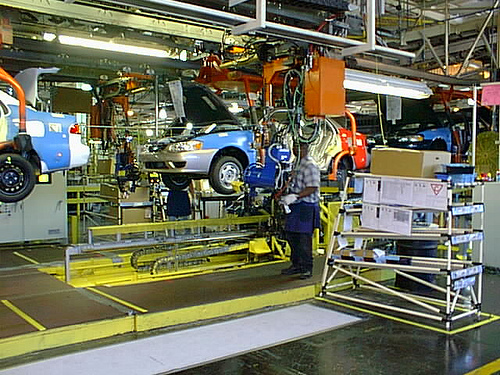 In fact, automobiles in a Toyota factory receive more attention to quality than patients in a hospital, not less. If reducing medical mistakes means learning from a car company, then learn we should. A delegation from Group Health stole the show here at LEI’s Lean Healthcare Transformation Summit with a demonstration of their lean management reporting process. Rather than presenting a drab slide show, the folks from Group Health essentially pulled three “andon boards” off their walls in Seattle and Burien, flew them to Orlando and gave a live demonstration. Tier one observations relate directly to patient care, right on the “shop floor,” so to speak. Work is standardized at each level, so any deviations from standard at the unit level mean patients are not receiving adequate care. Incidents of substandard care, essentially “defects,” are discussed among the nursing team and lean techniques are used to understand the problem and devise a solution to prevent the defect from occurring again. Examples of lean techniques may include A3 problem solving or root-cause analysis. Periodically, the unit manager meets with the clinic chief at the tier one board to discuss events of the past period. The board is arranged so areas where work is proceeding according to standard are green and deviations are indicated in red. The presentation is simple, clean and low-tech. A Group Health andon board in the wild. Similarly, key metrics at the clinic level are arranged on a tier-two board maintained by the clinic chief. At the conference, clinic operations manager Alicia Eng gave her tier one presentation to clinic chief Wellesley Chapman MD and he, in turn, gave his tier-two presentation to primary care assistant medical director Paul Fletcher MD. You could clearly see how managerial work is standardized; coaching occurs at each level; problems are addressed at the source; and information directly relevant to patient care moves up and down the organization. The exchange between Dr. Chapman and Dr. Fletcher was particularly insightful, thrilling and, at times, painfully realistic. It was as if they postponed their regular Monday meeting in Burien and conducted it onstage in Orlando on Wednesday instead. Afterwards, I asked Dr. Chapman about this and he said he and Dr. Fletcher prepared some topics in advance but that the conversation was real and, in fact, Dr. Chapman walked away with a fresh list of to-dos based on the onstage conversation with his boss. The next day, at lunch, I overheard a conference-goer say that one 20-minute “role-play” by the Group Health team was worth the price of admission. Indeed, Alicia Eng, Wellesley Chapman, Paul Fletcher and Lee Fried should be congratulated for their much-appreciated contribution to the conference. RK2 is well-represented at the Lean Enterprise Institute’s first annual Lean Healthcare Transformation Summit, happening now in Orlando, Florida. Although it’s a balmy 92 degrees here in Disneytown, we’ve been sequestered in chilly air conditioned conference rooms for days. Although he wasn’t expected to attend, Jim Womack is here, filling in as master of ceremonies and providing his incomparable perspective. Jim, of course, is the co-author of The Machine that Changed the World and is the leading American voice of lean management. I was pretty thrilled to chat with Dr. Womack and took the chance to ask about the origin of the term “lean,” a topic I covered in a previous post. As Womack explains it, the term was coined in 1987 during a white board session in Jim’s office at MIT with “seven or eight” folks including John Krafcik and John Paul MacDuffie. MacDuffie was fairly attached to the term “fragile,” a word used by a colleague translating from Japanese. Of course, John Krafcik used the term in his early papers, as well. However, it was pretty clear the term “fragile” wasn’t going to catch on with business managers. The group assembled around Dr. Womack’s white board thought about an earlier production system pioneered by Henry Ford (“channeling Hank” as Jim puts it). Observers at the time called his system of mass production “Fordism.” Henry Ford preferred “flow.” Afterall, that was a key attribute of the system. Materials flowed continuously on the assembly line. So what does one call the production system pioneered by Toyota? Toyotaism? Japanism? Those are words you use when you don’t have a clear understanding or theoretical framework. “Fordism” is what Henry Ford did, whatever that was. Mass production, flow production. Those are more descriptive, specific terms. “What is the key attribute of the Toyota production system?” Jim asked the group. Many of the ideas revolved around the concept of doing more with less. Less inventory, less shop floor space, fewer workers per unit. John Krafcik proposed the term “lean” and that’s what they went with. But, Womack said, lean still doesn’t perfectly capture the essense of the production system practiced by Toyota and others. Asked what name he would have used if he could re-name it today, Womack said he doesn’t re-live the past. Today marks the last day of a bold experiment in lean manufacturing. New United Motor Manufacturing, Inc. (NUMMI), the joint venture between Toyota and General Motors closed for good on April 1, 2010. 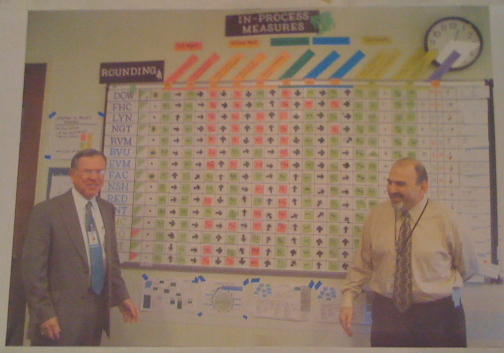 When I visited in October 1989 as part of my academic research in lean manufacturing, NUMMI was indeed an experiment. Large numbers of academics and industrial engineers studied NUMMI and their findings, shared with the world, aided the spread of lean manufacturing in the English-speaking world. For General Motors, NUMMI was a giant missed opportunity. They had a front-row seat from which to observe the Toyota production system for 26 years and, frankly, they squandered it, much to their detriment. Ford didn’t have the same luxury and yet they are now well on their way to transforming their operations to compete with the best in the world. Overall, NUMMI will be remembered as a success. It demonstrated, for anyone who still doubted, that lean manufacturing wasn’t a Japanese cultural trait but rather an integrated set of production methods that could be implemented anywhere by anyone. It established Toyota as a North American manufacturer. It’s possible some will regard this as a net negative, an invasion of sorts. Indeed, when Toyota and others began exporting increasing numbers of vehicles from Japan to the North American market, it was regarded by many as an invasion; and the resulting political pressure led to voluntary import quotas. However, a business model where vehicles are built on one continent and shipped to another is not sustainable in the long-term. The nature of automobile manufacturing is such that it can only succeed when makers develop engineering, marketing, manufacturing and a full supply chain on the continent where vehicles are consumed. So, rather than providing a foothold for an invading power, NUMMI was the first step in developing a renewed auto manufacturing sector in the United States. Ironically, NUMMI’s closure could be considered the second step in this renewal — the rationalization of production. As is clear from this excellent, if slightly dated, information graphic by the New York Times, auto manufacturing in the United States is clustered in a relatively tight corridor between the eastern Great Plains and the Appalachian Mountains. Due to its remote location, NUMMI never implemented true just-in-time delivery throughout its supply chain. It depended on deliveries of components and assemblies from Japan and elsewhere. The other outlier on the New York Times graphic is the General Motors plant in Wilmington, Delaware. Located on the eastern side of the Appalachians, it closed on July 28, 2009. NUMMI will be remembered alongside Ford’s Rouge plant and Toyota’s Takaoka plant as one of the most influential manufacturing facilities of the industrial age. Most things exist long before they are given a name. Lean is no exception. I’m not talking about the 12th century Old English word hloene, later Middle English lene, which our friends at Merriam-Webster define as “deficient in flesh” or “containing little or no fat”. I’m talking about a more recent coinage, referring to that revolutionary production system pioneered by Toyota. The year was 1989, Madonna’s Like a Prayer was topping the Billboard charts and I was writing my thesis at Reed College on the use of lean production management by Japanese auto manufacturers. Back then, lean, an elegant term that economically describes Toyota’s preeminent industrial achievement, was not in wide use. Had it been, perhaps my thesis title, Industrial Relations and Production Management in the Japanese Automobile Industry: The Case of Transplants, would have been shorter. In fact, it is well known that lean was coined by John Krafcik in his 1988 Sloan Management Review article “Triumph of the lean production system.” It is less well known that Krafcik adopted the term late in his academic career. 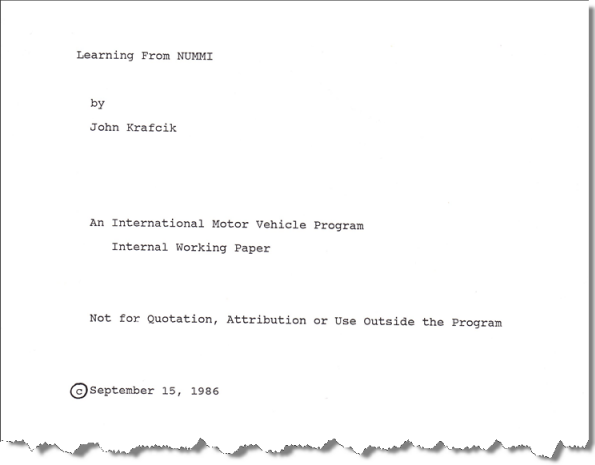 In his early academic papers, including “Learning from NUMMI” (1986 ), an internal working paper of MIT’s International Motor Vehicle Program, through his 1988 MIT masters thesis, he didn’t call it lean. He called the production system used by Toyota and a small number of other Japanese automakers fragile. So, when did it change from fragile to lean? And why? …Lean production is fragile. Mass production is designed with buffers everywhere — extra inventory, extra space, extra workers — in order to make it function. Even when parts don’t arrive on time or many workers call in sick or other workers fail to detect a problem before it is mass produced, the system still runs. The term fragile, while not terribly inspiring, made sense. In Krafcik’s early papers, he was drawing a distinction between robust manufacturing — the kind practiced by General Motors and others, characterized by large buffer inventory stocks, long production runs between die changes, vast factory floors and a high degree of specialization among factory workers — and, essentially, its opposite. In contrast, Toyota’s approach to manufacturing does indeed seem fragile. Inventories arrive just in time, so one slow delivery or one bad batch of parts and the whole factory can shut down. Making the system work requires flexibility on the part of factory workers. Flexibility requires investment and that investment can be easily lost if an economic downturn precipitates layoffs. The whole thing seems on the verge of collapse. To resolve the question, I contacted Glenn Mercer, Director of MIT’s International Motor Vehicle Program (IMVP) and he very generously conveyed my etymological query to John Krafcik, now President of Hyundai Motor USA, and John Paul MacDuffie, another influential researcher who is now Associate Professor of Management at Wharton. So there’s your answer. Clearly, calling a production system fragile, though accurate in many ways, is no way to sell others on its merits. Without this re-branding, would lean production have gained acceptance in the English-speaking world? I like to think fragile production would have succeeded on its merits but it likely would have struggled in the marketplace of ideas. You can use a name like Smuckers to sell jelly but management concepts are another matter.